The Advanced Wakefield (AWAKE) Experiment is a project at CERN to verify the approach of using protons to drive a strong wakefield in a plasma which can then be harnessed to accelerate a witness bunch of electrons. The effect of high electric fields in a plasma has been observed before with either lasers or an electron beam driving the initial disturbance. These fields can be up to 100 GV/m, or about 1,000 times higher than fields achievable in conventional RF accelerators. The idea of using a proton beam has been proposed where because of the high energy beams available, such as the SPS or LHC, the acceleration of a witness electron beam up to the TeV scale can be done in one stage within a distance of O(km) rather than 30-50 km needed for conventional accelerators. A short proton bunch creates a wakefield in the plasma that can be used to drive another charged beam. The principle of plasma wakefield acceleration is shown in the schematic. A short incoming proton beam enters the plasma and attracts the free electrons to it; they accelerate towards it and overshoot. They are then attracted back to the region of positive charge, the ions, and again accelerate in and overshoot. These oscillating free electrons in the plasma create and accelerating electric field in the direction of the proton beam. Another witness beam of electrons can then be injected in the right phase behind the proton beam so as to be maximally accelerated through the plasma column. The proof-of-principle experiment will be carried out with the CERN SPS beam which has 400 GeV protons, but a relatively long beam of 12 cm. The experiment will therefore rely on the self-modulation of the beam where the wakefield splits the long proton beam up into mini-bunches which then drive the wakefield for the trailing electrons. The experiment aims to accelerate the electrons from some initial injection energy of 10-20 MeV to over 1 GeV in about 5-10 m. The experiment will require several beams (proton, electron and laser) entering a plasma cell, correctly timed and multiple diagnostics to measure the plasma density and the properties of the proton and electron beams. UCL is leading the development of the electron energy spectrometer and is also involved in a diagnostic to measure the plasma density using the phenomena of photon acceleration. 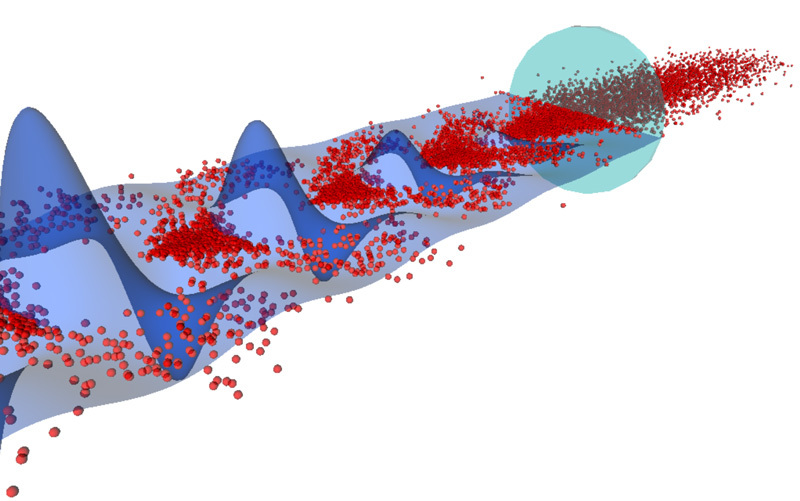 Artists impression of the AWAKE protons (red) micro-bunched by the plasma wakefield (blue). The results of the AWAKE experiment could lead to a future high energy collider of much reduced length and hence cost. Related to the AWAKE Experiment, we are peforming simulations of the the self-modulation of the Diamond electron beam. This beam is also quite long, 2.6 cm, and if micro-bunched, could drive significant wakefields. The simulations could lead to an experiment using the Diamond beam which would allow us to learn a lot about the self-modulation process and diagnosing it. This could also lead to a technique of increasing the Diamond beam energy by several GeV in just a few metres. Simulations done by the group use the high-performance resources available on the Legion cluster at UCL, SCARF cluster at STFC-RAL and the STFC DiRAC2 cluster. For more information on the activities of the UCL AWAKE group, please contact Prof. Matthew Wing or Dr Simon Jolly for more information.